Earn easy income in the very lucrative iPad apps market. Now you can cash in on the iPad App gold rush without needing to know anything about programming. Finally, an affordable, step-by-step course for technical dummies revealing how to create & sell hot selling iPad apps. Dont miss your chance to cash in on this goldmine of an opportunity. The Simple Step-By-Step Formula For Making Cash With iPad Apps For Non-Techies! In this module youll get a crash-course on how the iPad and Apps works, the many features etc. Youll also get a peek inside the App market to familiarize yourself with how everything works. This is a great starting point for developing new ideas for creating hot selling iPad Apps. This is where all the fun begins! This is the most crucial stage because you dont want to spend a lot of time or money creating and marketing something that didnt have any potential in the first place. The most important step is inside this section! MODULE 3: Developing Your App Yourself! You can also outsource the creation to an expert for very cheap if you prefer that. Im giving away all my top resources! You can be churning out profitable Apps left and right with little to no work at all! MODULE 4: Selling The Socks Off Your App! Once youve got your new killer app on the market, now its time to WATCH THE CASH ROLL IN by marketing the socks off of it! Here I show you how to get as many eyeballs seeing your app as possible. I have several ways of doing this and theyre amazingly simple & CHEAP (if not FREE)! BONUS: Getting Started .MP3 Audio Interview! In addition to the PDf course modules, youll get a 20 minute bonus MP3 audio to listen to right away! * And more insider App secrets from these two experienced marketers! [YES] Can sell on forums, auction sites, classified sites, etc. 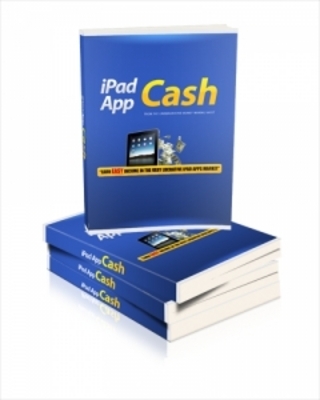 Ipad App Cash Formula With Mrr + Bonus !